WriteLog version 11.24 introduces a configuration option to connect two radios to a single PC using a separate sound device for each. 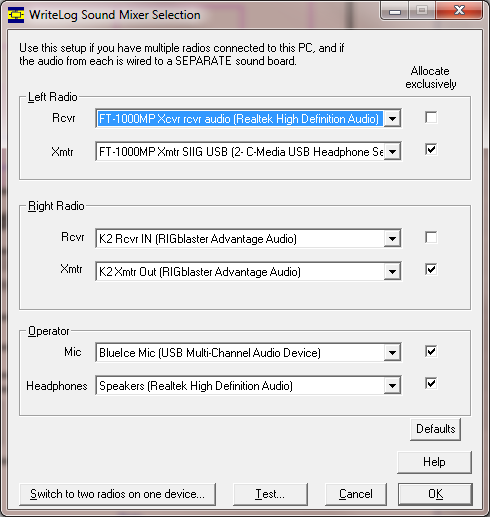 The original configuration option, connecting two radios to a single PC using the Left and Right channels of a single device, remains supported. If you only have one radio connected to your WriteLog PC, then there is no important functionality difference between the original option and this one. 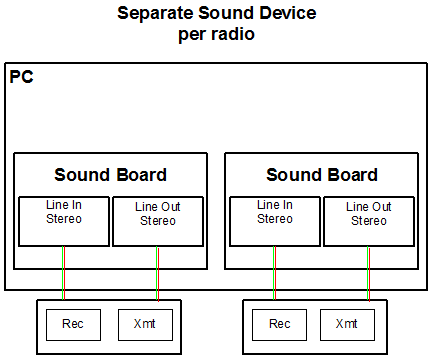 The remainder of this page is to explain why you might want to use a separate sound device per radio on a single PC. Only one sound device is needed and WriteLog supports SSB, CW and digital modes for both reception and transmission on two radios. Omitted from the drawing, but also supported by WriteLog, is the connection of a microphone to a sound board and routing its audio to either the Left or Right transmitter as you move WriteLog’s transmit focus. Depending on the Windows version, that microphone might (Vista and later) or might not (XP and earlier) need a separate sound board for WriteLog to support it properly. Ground loop isolation transformers are recommended in both the receive and transmit directions, but are not shown in the diagrams. It happens there are ham-oriented vendors that build devices that match the needed cable configuration. Purchasing a RIGBlaster, for example, removes the necessity of homebrewing cables. I have used WriteLog with the RIGBlaster Advantage, which has performance I can recommend for contesting operations. The only caveat is that the RIGBlaster Advantage receiver input is single channel monophonic, which means that any subreceiver audio your rig happens to produce is not available to WriteLog, and therefore cannot be routed to its headphones output. I have also tested with the RIGBlaster Blue, which I cannot recommend for contesting, mostly because I was unable to configure the bluetooth version to switch between transmit and receive faster than about 500 milliseconds. Modern PCs can support several sound devices installed together, and that opens up the possibility for WriteLog to accomplish more sophisticated sound routing and recording, particularly if you add enough to cable up your station headphones and speakers as well, as in this picture. To setup WriteLog to use such a setup, use its Start Menu entry named Sound Board Mixer Selection. 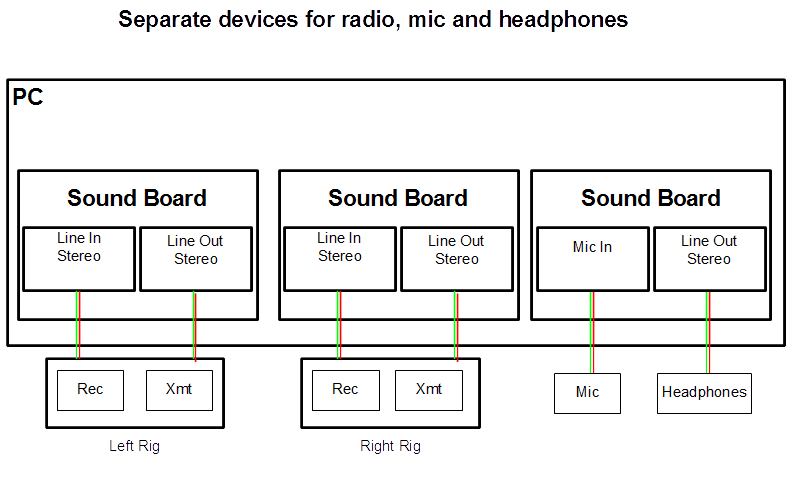 The cabling picture shows that, for a given sound board and rig, the receive and transmit would be wired respectively to the line in and line out and that is the recommended configuration. But its recommended only because that makes it easier for the operator to track what is connected to what. The in and out of all modern sound devices operate independently. The Allocate exclusively button is there because of a performance subtlety. With exclusive allocation, the Windows operating system enables WriteLog to operate the devices involved with minimum latency (i.e. delay) between an incoming sound and an outgoing one. This is especially important for the “Echo Mic” feature, where your voice is routed through the PC. However, hams running digital operations commonly use a decoder program separate from WriteLog, like MMTTY or 2Tone, and even multiple decoder programs running in parallel on the same input concurrently, and WriteLog’s exclusive allocation would not allow those separate programs to open the device. Even more subtle is that if you use a separate sound program in the transmit direction for AFSK, you might expect to need to turn off the Allocate exclusively selector for the corresponding rig’s transmit audio. It turns out that is usually not the case. Allocate exclusively can be turned on as long as WriteLog’s Echo Mic feature is turned off (because that removes WriteLog’s use of the transmit audio sound device), and, in fact, bringing up the RttyRite window corresponding to a given sound board will cause WriteLog to turn off its Echo Mic feature without the operator having to bring up that particular dialog control. The Defaults button on this selector dialog sets the Allocate exclusively according to this “normal” configuration, with non-exclusive access to receiver audio, and exclusive (minimum latency) allocation of the other devices.